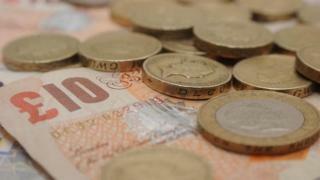 The number of people declared insolvent in Wales rose by more than 14% last year, latest figures have revealed. The increase prompted stern warnings from debt advice groups, who said their debt caseload was at "record levels". Citizens Advice Cymru said they were concerned about debt levels among the 18-25 age group in particular. The figures show regional variations across Wales, with Merthyr Tydfil's insolvency rate more than double that of Ceredigion. The data, compiled by the Insolvency Service, shows the number of individuals made insolvent in Wales in 2016 was 5,349, up from 4,680 the previous year - a rise of more than 14%. Merthyr Tydfil had the highest rate (31.6 per 10,000 adults) and Ceredigion (14.4) the lowest. The figures also look at insolvencies based on age and gender. Across the whole of England and Wales, the highest total insolvency rate was in Torbay (43.0 per 10,000 adults). In England and Wales, the individual insolvency rate per 10,000 adults was higher for women (20.6) than men (18.7) and the gap between female and male rates has widened steadily from 1 in 2014 to 1.8 in 2016. The figures also reveal Newport posted the third-highest rate of bankruptcies (5.7 per 10,000 adults) in England and Wales, and Blaenau Gwent the third lowest (1.6). Fran Targett, chief executive of Citizens Advice Cymru, said: "People who are struggling with debt should be supported much earlier so that insolvency doesn't become their only option. "In the last year we helped 23,000 people in Wales with debt issues and are aware that, in some cases, the behaviour of lenders is making people's problems worse." He added it was important for credit card companies to act sooner to prevent debts from worsening, by offering manageable repayment plans. Shelter Cymru is concerned about rising debts levels among people aged 18-25, where insolvency figures showed a year-on-year increase of 43%, up from 177 insolvencies in 2015 to 253 in 2016. However, insolvencies among this age group made up less than 5% of the overall number in 2016. A spokeswoman said: "In recent years we've seen an increase in female insolvency but there also seems to be a trend amongst the younger generation who are struggling with debt and the high cost of living. "Young people under 25 years old in particular are facing huge financial difficulties and are reliant upon debt to meet day-to-day living costs." She urged people to avoid payday loans and doorstep lenders, but added lenders had a responsibility to assess affordability before offering loans. Peter Tutton, head of policy at StepChange Debt Charity, said the high ongoing levels of insolvencies and number of people seeking debt advice reflected the large number of households in Wales that were in financial difficulty. He said: "The level of consumer borrowing is high by historical standards and the numbers of people seeking help from StepChange Debt Charity are at record levels. "There remain questions as to whether the current legal help is really meeting the needs of people in financial difficulty." StepChange Helps Over 500,000 People A Year. Find Out How.